When one of my spiritual confidantes suggested that I bring my music, yoga & Ayurveda practices together, I already had the idea for A Musical Journey Through the Chakras simmering on the back burner. The idea stemmed from a concert I attended many years ago that affected me so profoundly that I’ve never forgotten the experience. I had always known that music is a spiritual thing for me, but I had yet to actualize it. The concert opened my mind to pursuing a spiritual practice when the opportunity arose, for the sake of mastering music performance. I wanted to experience firsthand what I saw in those musicians, which was that, apparently, playing music for a group could be a fun experience full of bliss and deep connection. Since I’d always had incredible stage fright up to that point, this was a revelation. The result of my inspiration took me to study yoga & flamenco. 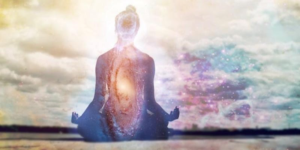 All the masters I’ve listened to about the chakras, including Myss, emphasize the need for spiritual practice in order for transformation to occur in a tangible way. You can’t just get some therapeutic practitioner to ‘open your chakras’ for you, any more than you can hire someone to exercise for you. But if you haven’t got a practice, don’t be dissuaded. I can attest that the concert I attended activated something in me permanently. Have I done a lot of personal work to bring my vision to life? Absolutely!! And, I think having a firsthand experience what’s possible and seeing living examples of others’ mastery inspired me to begin actualizing my own vision, and it continues to prod me onward to the next step. As it turns out, the next step is to let go of the past, as completely as possible. We all have the same 24 hours, as the saying goes. If our attention and energy are taken up with the past, which happens easily and unconsciously, only a small part of us is actually ‘here’ for those hours. I’m becoming aware of exactly when, where and how my attention off on its own and I’m more determined than ever to bring my attention into the here & now. This is an example of one of the many types of spiritual practice. While this specific one is new to me, I’ve done many other things in an attempt to make life more orderly and less chaotic. As I’ve learned to use my personal energy increasingly efficiently, I’m noticing that I accomplish more with less effort, my work is becoming more inspired, stressful things bring less consternation, changes large and small are easier to deal with and I’m more open to ideas I would never have entertained before. A Sensory Journey Through the Chakras shares the fruits my own spiritual practice. The workshop features my original compositions, Ayurvedic knowledge, combined with the work of Reiki master and energy healer, Sandy Mulroy. As we were creating the content for this workshop, we were both in awe of what the other was bringing, and the work left a lasting impression on both of us. If this event appeals to you, I suspect you’ll really enjoy it as much as we have in putting it together. I’ll also share more about the exact method I’m currently using to bring my attention into present time!